Produktbeskrivning för Miss Sixty Bridge Classic Patent Peep Toe Court Shoe: Patent leather peep toe court shoes by Miss Sixty . 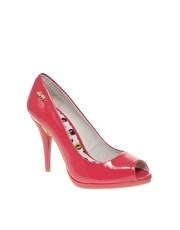 Featuring a narrow stiletto heel with a contrast insert, metal branding to the side and a striking printed inner sole. ABOUT MISS SIXTY Combining signature skinny jeans and bodycon dresses, with heavy embellishment and fashion-forward cuts; Miss Sixty pay homage to iconic trends, past and present. Focusing on silhouette shapes and bold colours, the Italian brands identifiable style transfers seamlessly to shoes, boots and accessories.